“Scenic hillsides, a meandering river, stone bridges, and picturesque buildings…” — it’s easy to understand why artists have long been attracted to Bronxville. The art colony that was established here in the late-19th century is well known to many, but less familiar is the fact that earlier notable artists as well as art patrons have been part of the village almost since its inception. The artistic legacy Bronxville so enjoys is just one of the many cherished parts of our past that the Conservancy has embraced over the past ten years, and it seemed only fitting to celebrate our 10th anniversary surrounded by some of the finest works of Bronxville’s artists at the OSilas Gallery’s recent exhibit: Bronxville Artists: Legacies Past and Future. 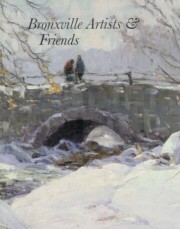 Curated by Art Historian and Conservancy member Jayne Warman, the exhibition was a gathering of privately owned works of art by Bronxville artists, both past and present. Because the art was on loan from the collections of private individuals (the majority of whom are Conservancy members), it was a singular presentation of artworks that probably will never appear together again. As Conservancy Co-chair Nancy Vittorini noted in her welcoming remarks, this celebratory event was a delightful partnership for the Conservancy and Concordia College. With the OSilas Gallery mission of integrating the visual arts into the cultural and educational life of Concordia’s campus and community, and the Conservancy’s quest to bring Bronxville artists’ work back home, it was a perfect marriage! Marilynn Hill, who, with Bob Riggs, has served as Tenth Anniversary Co-chairs, presented members with copies of an art catalogue that was published by the BHC in honor of both the anniversary and the exhibition. Warman followed with a talk in which she shared insights into the lives of the Bronxville artists and their canvases — elaborating on remarks she had given at the exhibit’s Concordia opening a week before. Members were able to enjoy a festive champagne reception while viewing the collection, thanks to the efforts of BHC events chair Mary Thaler.